The Car Dealership - a place to buy a Toyota or a Hoopdee! 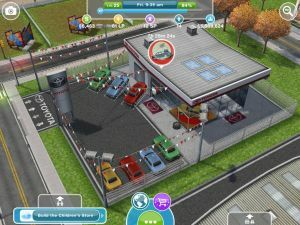 One of the more desirable businesses in your Sim town - and not just because it adds nice value to the town - but also because hey, Sims gotta have cars to cruise around and go to work and cars are cool! Seriously though, in addition to serving as a Credit Sink where you can spend Simoleons for some fancy rides, it is also a venue that has been used in the past by advertisers - Car advertisers - which means every now and then you may find a free ride there. Star Rating: The Star Rating is basically the level of quality of the produce and therefore the measure of satisfaction that owning it will bring for your Sim. Clicking on the Car parked outside of their house gives you to options - to Relocate the car - and Go for a Drive (3m / 15 XP). When I added a sim she came with a car but all my other sims don't have one! Why is this? There are a couple of special reward houses that come with cars - the Teen Idol Mansion being one - that I think you get whether you have the dealership or not, but ordinarily I believe you need the Dealership. Can you buy the houses to get free cars without building the car dealership?? Why can't I sell the car! Send ur ppl to work or complete a lot of quests,or cheat and pay for more simoleons and LPs!😉hope this helped! The car you purchase will not appear in your inventory. The car you purchase will automatically appear outside of the house of the Sim that purchased it - and that would be whatever Sim it was that you hace active at the time of the purchase. I got ripped off..... I bought my car and I went to my inventory to find it and it wasn't there !!! I completely wasted my time and money on the car dealership I hate it !!!! i bought a car for my sim, then i bought his wife a car and the first car disappeared. only the vehicle for for the wife is at the house, where did the other car go? If the car is not in your personal storage bag than it is gone - the game has either swapped it into personal storage, or treated the second purchase as an upgrade and discounted it to the value of the first car. Don't worry the car for the man might of accidentally been placed in your inventory, if it wasn't something to do with the game probably caused it. Which is the best level 1 car to own? Which 1-star car is the best one to own? Why can't I find the car dealership?! You have to build the car dealership, whichis the thing right next to the golden gate bridge like bridge. You build a new house so that you can put a car there... As far as we know that is the ONLY way you can do that. What if every house has a car how do you get another for the weekly tasks??????????????? The Car Dealership does increase the value of your town, sure but it ALSO allows your Sims to buy a car (there are free ones from promos) which you cannot do without you have the Dealership so... Yeah, it has value. Do the cars offer anything other than value to the town and small experience? I need cash to progress other things that offer more benefit and considering selling mine as just sit there. To use a car just have an adult sim present and tap it, then go for a drive. I have a car! How d I use it? So you have to buy a car with your real money on android? I waited so long it cost me 275 000 to build. Only 16 hours til it's done tho! I find growing watermelon is the fastest way to make money. I'm averaging about 75 000 a day, with 14 Sims growing. Good luck and have fun!! Once you get to a certain level (8 or 9) you can skip levels for 5 LP. Can you add a daycare so the parents can both go to work and make the babies be able to atleast go there? Can more than 3 cars be on the road at one time? It is near the super market and is 15,000 to buy try planting beans and other crops to earn money. Do other missions to to get money and LP. Hope this helps! if you have a car a don't want, but want to buy a more expensive car how do you trade it in.? I can't find where it is???? I can't find it it. me too! There is no option to skip goal so I'm stuck. help help help!